Pattaya Dentist, Dental Implant and Cosmetic Specialist, Teeth Whitening, Veneers and more. 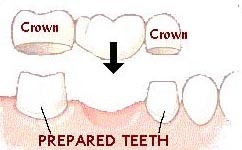 Dental Crown is also called dental cap. 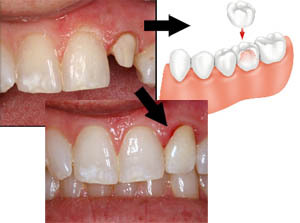 When you lost your tooth structure and dentists cannot fill the cavity by just normal dental fillings, you are required a crown to cover that tooth. In fact, patients can lost their tooth structure from many causes such as badly tooth decay, broken by accident, undergoing root canal treatment, etc. It would be deemed as a cover as the crown will cover or replace part of the tooth seen in the mouth. Another advantage of dental crown is about aesthetic. Dental crown can help patient for teeth appearance and this is called cosmetic dental works or smile makeover because dental crown can correct chip, discolor, misshape and alignment teeth. Dental Bridge is quite similar to dental crown. Normally, dental bridge is consist of two dental crowns and one pontic. Dental bridge is used in the patient who lost their tooth structure and no remaining tooth left to be crowned. Dentist need to use prep crowns on nearby teeth one on the right and one on the left to neighbor pontic and replacing missing tooth space. Base metal alloys are non-noble metals with a silver appearance. They are used in crowns, fixed bridges and partial dentures. They can be resistant to corrosion and tarnishing. They also have high strength and toughness and are very resistant to fracture and wear. 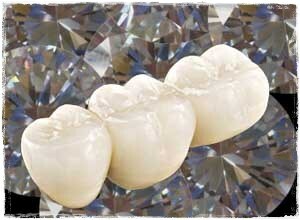 Noble Alloys contain gold, copper and other metals that result in a strong, effective filling, crown or a bridge. They are highly resistant to corrosion and tarnishing. Gold alloys exhibit high strength and toughness that resists fracture and wear. This allows the dentist to remove the least amount of healthy tooth structure when preparing the tooth for the restoration. 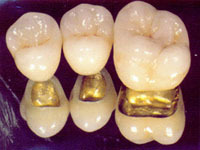 Gold alloys are also gentle to opposing teeth and are well tolerated by patients. However, their metal colors do not look like natural teeth. Some patients may show allergic sensitivity to base metals and there may be some initial discomfort from hot and cold. All porcelain crown are recently made to deal with this problems. Full porcelain or metal free - there is no metal inside. Because porcelain fused to Metal has disadvantages for biocompatible, some patients show allergic sensitivity after use crowns and bridges 1-2 years because of some particular alloys used in crown and bridge. So, full-porcelain (metal free) play key roles in this kinds of patients. Full porcelain restoration is made of dental materials include porcelain, ceramic or glasslike fillings and crowns. They are also used as inlay/onlay, crowns and veneers. Full-porcelain restorations are particularly desirable because their color and translucency similar to natural teeth. The disadvantage of full porcelain over porcelain fused to metal is resistant to fracture when placed under tension or on impact. The strength of this type of restoration depends on an adequate thickness of porcelain and the ability to be bonded to the underlying tooth. They are highly resistant to wear but the porcelain can quickly wear opposing teeth if the porcelain surface becomes rough. However, new technology Zirconia can overcome this problem. Dentist @ Beach offers 3 types of full porcelain dental ceramic; IPS Empress, Procera and Zirconia. Procera another brand from Sweden (Noble Biocare) but made of Alumina Oxide ceramic as well. However, it is used CAD/CAM technology to mill its core. I personally don't suggest for oversea patients who have a short time in Thailand because working time is unpredictable as we need to send dental impression to Sweden to mill this. Zirconia or Zirconium Oxide is widely used in space industry from space suit aircraft parts because of its durable and erosion resistant. Zirconia is the same component of jewelry sub-structure and more suitable for posterior teeth where require greater loading chewing forces. This is latest ceramic technology and the most strength materials in Dentistry market at the moment. In first visit once you arrive Pattaya and our dental practice, dentists will discuss about selections of crown and bridge restoration, choices of treatments such as implant, advantages and disadvantages. Xray examination is required in some cases that to check health of root and tooth structure. During this visit, dentists will also explain you about working procedures, time-frame, limitation and costs. Dentist will prepare a tooth dental crown and bridge by removing 1-2 mm of enamel surface and existing tooth to accommodate the restoration. Then, dentist will take patient teeth impression. This model will be sent dental laboratory in order to craft porcelain crown and bridge restorations. It usually takes around 4-6 days. In this visit, temporary dental crowns will be made. So, you will have no problems for smiling and eating while waiting for permanent one. In some case, dentist will ask a follow-up visit in for post check up such as gum responding to the presence of new crown and bridge or examine the crown and bridge placement before you can left Pattaya. Copyright 2019-2020 (c) Dentist @ Beach Dental Clinic Co., Ltd. All rights reserved.